Aka-Zuiki Quick Pickles (Red-Taro-Stem Vinegar Pickles) – I'll Make It Myself! 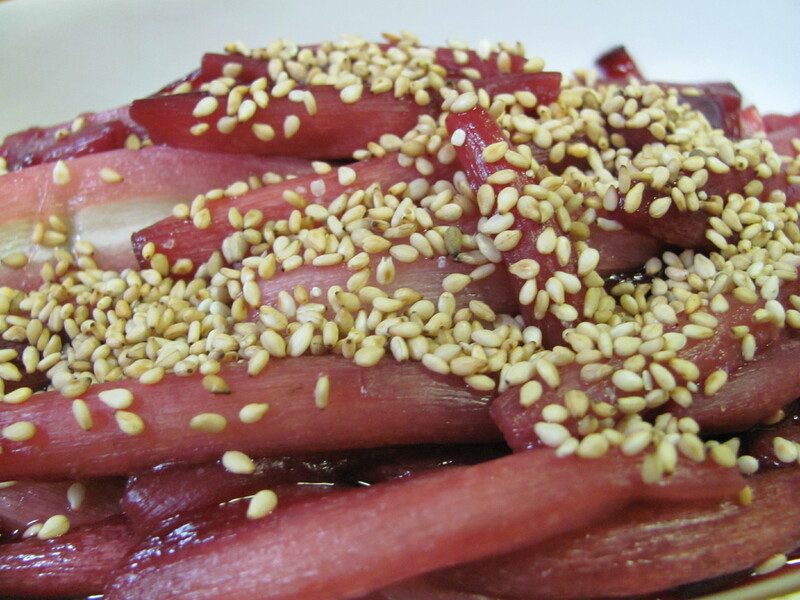 Japanese food traditionally includes a lot of tsukemono (漬け物), or pickles. The first thing most Americans will think of when you say pickles is dill (cucumber) pickles that go with sandwiches; however, pickles are any vegetable that has been preserved with brining. Japanese pickles cover a wide range of base ingredients, including carrots, cucumbers, ginger, and plums; as well as a wide variety of pickling styles: salt, miso, vinegar, nuka (rice bran), and more. Some recipes call for the pickling mixture and vegetables (or fruit) to be aged overnight or for several months, but this recipe can be consumed right after cooking! Aka-zuiki (赤ずいき) are another Kaga Yasai (加賀野菜, Kaga-region heirloom vegetables) and are in season from mid-June throughout September. Zuiki is the stem of the taro plant (satoimo, 里芋), a slimy potato featured in Japanese cuisine; Americans might know taro as a flavoring of Asian desserts, especially in bubble tea (boba). Aka-zuiki just means red zuiki, and the stem has a reddish color which is enhanced by vinegar. Much easier to chop and peel by hand than to use a vegetable peeler. Bento with aka-zuiki pickles, herbed salmon, brown rice, eggplant-somen, roasted peppers, and corn. This is my favorite way to prepare aka-zuiki–the sweet-and-sour flavor of the pickled stem combined with the brilliant magenta color the vinegar brings out is a sure-fire way to punch up any bento. You also could reserve any leftover liquid to “dye” rice for creative bento. Zuiki has to be soaked and salted to cut the bitterness and remove the liquid that can irritate skin, so don’t skip those steps! Also, fresh zuiki goes bad fast–be sure to cook it within 1-3 days of purchase, or the stems will practically dissolve. The pickles hold up much better, though, retaining their flavor and texture for at least a week. I like them so much that they never last longer than that, though…. 1. Cut the stems into ~6-cm-long pieces. Peel by hand, and place in water. When you are done peeling, drain into colander and toss the stems with salt. Let sit for a few minutes and prepare the liquid. 2. Mix together the vinegar, salt, and sugar in a small bowl. 3. Rinse the salt off the stems, and squeeze out the water. 4. In a large frying pan, parch the stems over a medium flame; cook until most of the water has evaporated. 5. Add the liquid from step 2. Cook over a medium-low flame, stirring frequently, until most of the liquid is reduced. Be careful not to burn the liquid or stems. 6. Add sesame seeds right before serving (to keep them from getting dyed or soggy). Serve warm or cold. Once pickled, aka-zuiki will last for over a week. I would recommend consuming the pickles within the week, but it’s possible they would last longer. Store in an airtight container in the refrigerator.